Rejecting the claim of General Motors that it still owns rights in the mark LASALLE, the Board dismissed an opposition to registration of the mark LA SALLE for motor vehicles, including automobiles. Applicant Aristide appeared pro se and neither submitted evidence nor filed a brief, which is usually a formula for disaster at the TTAB. Not so this time. General Motors Corp. v. Aristide & Co., Antiquaire de Marques, 87 USPQ2d 1179 (TTAB 2008) [precedential]. Under Section 67 of the Trademark Act, Applicant was entitled to rely on the filing date of its foreign priority application as its constructive first use date: December 15, 2003. The first question for the Board, then, was whether General Motors possesses common law trademark rights from a date prior to Applicant's priority date. 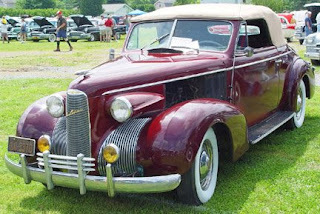 General Motors admitted that it has not produced any vehicles under the LASALLE mark since 1940. Moreover, the Board found no evidence "that convinces us that, after a sixty-five year hiatus, [GM] has any serious intent to reintroduce a LASALLE vehicle that was last marketed prior to America’s involvement in World War II." Furthermore, the Board could not find that the General Motors mark enjoys any residual goodwill. "Opposer’s evidence that there are some car collector clubs that also collect LASALLE vehicles and that other car brands have been reintroduced is not very significant evidence." Next, the Board looked to General Motors' licensing of its mark beginning in the 1990s to see if Opposer established a "new priority date." General Motors submitted evidence of numerous licenses: agreements with manufacturers of vehicle parts for the restoration of LASALLE vehicles, and licenses for a wide variety of consumer products. As to the vehicle parts licenses, most of the parts did not bear the LASALLE mark. GM had three licensed products "to which it might have affixed its LASALLE trademark, the monogram running boards, pedals, and custom fitted floor mats." However, it was not clear that these particular goods were actually sold, and if sold, how many were sold. The Board therefore found "no basis to assume that, even if there were actual use, its was more than token use." As to the consumer product licensing, GM failed to prove that "it has actually used the LASALLE mark on the licensed products." The licenses involved dozens of trademarks, and "it is simply unclear whether or when and on what goods opposer's LASALLE mark has actually been used." Nor was there any evidence of sales volume. Finally, these licenses did not begin until 2001, and some were executed fairly close to Applicant's priority date. Thus there was a question at to whether any marketing of LASALLE licensed products occurred before Applicant's priority date. Taken as a whole, the evidence showed that GM stopped using the LASALLE mark in 1940. Although it subsequently licensed the mark, along with hundreds of other marks, GM failed to establish that it "actually used the mark on any goods prior to applicant's priority date." The Board ruled that GM had failed to establish priority of use subsequent to its abandonment of the mark 60 years ago. "[O]pposer's LASALLE mark was abandoned for a period of at least three years after 1940. Opposer has neither shown that it had an intent to resume use nor established a subsequent priority date." Therefore, Applicant prevailed. TTABlog comment: What would you have done differently had you represented General Motors? Obviously, better proofs would have helped with regard to the licensing issue. Findus, Atari, Pataugas, T-Leclerc, Continental Edison, JL Scherrer, all these brands had disappeared, but not in memory of consumers. They were ably revived and was imposed with even greater ease they still have a strong awareness and sympathy of the public. It is the job of ARISTIDE Antiquaire & Co Marques to offer quality brands to companies seeking name.And whatever the sector of activity: food, clothing, recreation or hygiene and cosmetics. We perhaps in our brand portfolio perfect for your products! The subject application was filed under Section 66(a) without proof of use in the USA. What issue would you have explored under these circumstances? For a big fat hint, see Section II of this article. GM did use a variant of the Lasalle name (Lasalle II) on at least one show car during the 1950s. I wonder if the use of it for similar promotional efforts after that would have been enough to maintain GM's ownership of it. It would be interesting to know to what lengths GM would go to protect the despised "Cimarron" brand label.